At Shoprite we make it our mission to bring you low prices on the best products. FREE Lovies Wipes Pack with every pack of Lovies nappies you buy. Buy any 3 Johnson’s baby soaps and only pay for 2. Offer ends 8 May 2016. Buy 2 500g Blue Band Original Spreads & get K10 FREE Airtime! Promotion runs 20 June – 3 July 2016. Redeem voucher at till. T&Cs apply. Ask your cashier to add the Airtime at the till BEFORE you pay. 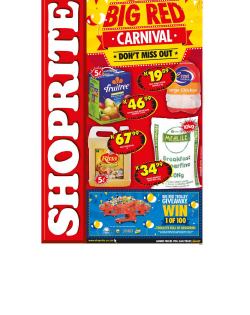 Check out these amazing weekly deals from Shoprite!